Topsoil is the uppermost layer of soil, which is high in nutrients and organic matter. It is widely available to buy in bags or in bulk from specialist suppliers, garden centres and DIY superstores. It can be used for making new beds, borders, raised beds or as a base for lawns, where the natural soil is poor or non-existent. You may need to buy in topsoil if the existing soil is poor, damaged or if the space to be gardened has no natural soil, such as a courtyard or patio garden. 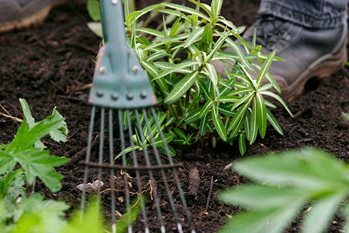 Many gardens have poor soil, such as those found behind new-build homes, where the natural topsoil has been stripped away during the construction process. Topsoil can be used to cover the ground, to create new beds, borders or to provide a base for turf laying or sowing grass seed. In paved gardens where there is no access to soil, topsoil can be used in raised beds for growing many plants, including vegetables. Topsoil is generally available to buy in three different grades: premium, general-purpose grade and economy grade. To avoid later problems, it is best to check the topsoil before buying it. Look out for high stone content, thick fibrous roots, weeds and contaminants such as glass and brick. Inspection will enable any concerns you may have to be discussed before purchasing it. Ask the supplier where it is coming from and whether it all has the same origin (building sites are often used as a source and the quality can be variable). If the supplier has had soil analysis undertaken, request a copy. If they claim it is good and state facts and figures request these details in writing. Note that imported topsoil can sometimes introduce invasive plants, such as Japanese knotweed and couch grass to the garden. Inspect the soil for signs of weed roots or shoots. Weed roots are often white and fleshy, sometimes with a brown covering, unlike the brown, dry, fibrous roots of trees and shrubs.